Pituitary Growth Hormone is a protein hormone that is synthesized and secreted by cells called somatotrophs in the pituitary. 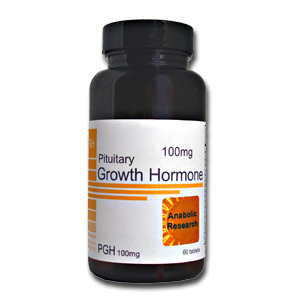 Pituitary Growth Hormone controls and/or effects many physiologic processes, including muscle growth and fat metabolism. When Pituitary Growth Hormone is generated within the body, Pituitary Growth Hormone is called endogenous and when it is administered from an outside source it is called exogenous. Growth Hormone, like many other hormones has both direct effects (acting directly on tissues and cells) and indirect effects (stimulating the release or synthesis of a hormone, like IGF-1, which will then in turn effect tissues and cells on its own). Muscle cells have both Growth Hormone receptors as well as IGF-1 receptors. When growth hormone or IGF-1 is introduced into muscle cells, more cells are created and existing cells are enlarged. These responses are known as hyperplasia and hypertrophy, and are the processes that contribute to the growth of additional muscle tissue. Growth Hormone also has the ability to directly influence Fat-Loss, as fat cells have Growth Hormone receptors. When Growth Hormone is introduced into a fat cell, the result is that the fat cell is then more readily used as energy. This process is known as lipolysis, typically called burning fat, which Pituitary Growth Hormone does simply, the conversion of fat into energy. However, while muscle cells possess both Growth Hormone as well as IGF1 receptors, allowing Growth Hormone to have a direct as well as indirect effect, fat cells do not have an IGF-1 receptor. IGF-1, which is stimulated by Growth Hormone production, works in a totally independent manner to burn fat in the body by enhancing protein, fat, and carbohydrate metabolism. Thus, Pituitary Growth Hormone has both direct as well as indirect effects on promoting muscle growth, and fat loss. Finally, based on anecdotal reports from people experienced with Pituitary Growth Hormone , results often take 6-8 weeks to manifest. At the 6-week point, athletes typically report that results are beginning to show, but by week 12 (and beyond), the increase in muscle mass and fat loss are nothing short of amazing. This is why athletes often stay on this compound for a minimum of two months, but usually closer to three or four months at a time.